Bandage - Now Textured, Powder Free, Talc Free and Latex Free! 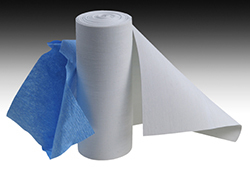 Used to control and exclude blood flow during surgical procedures, TETRA Esmarch bandages are constructed of strong, white synthetic material to provide maximum compression in a totally powder free, talc free and latex free product. The first of a kind textured finish allows for better gripping and easier application. The polymer used offers excellent elongation with no weak points prone to breakage in applications requiring extended stretching. Tetra Esmarchs are eco-friendly and have no added fillers harmful to the environment. This product is TAA compliant. Formaldehyde Free, Latex Free and MBT Free. Each roll is CSR wrapped, enclosed in individual peel down Tyvek/poly pouches, packed 10 per box and gamma radiated. Sold by the box. * product note: The 7133-09 and 7133-12 are currently available only in the traditional smooth finish. ©2017 TETRA Medical Supply Corporation. All Rights Reserved.